Have you noticed that the food revolution is bringing us new trendy and tasty foods all the time? We seem to favorite certain treats and this helps us get really creative in the kitchen. If we look at what sweet treats are doing well now, we can see that cupcakes are definitely the ‘plat du jour’. Cupcakes were supposedly invented in Britain in the Victorian times, where maids used to scrap together left over batter and cook small cakes in teacups for themselves. This obviously developed from here, and what we have today are fun and tasty treats with endless combinations. We continue to innovate and push the boat out which has led to some fantastic creations that show off the flexibility of the humble cupcakes. Here are 3 varieties you can try to make yourself, and I hope you can take away some inspiration for your next home baking project. Coffee lovers can indulge in these rich and adult treats. Make a standard cake batter from flour, eggs, caster sugar, unsalted butter and a little baking powder, and then just add some coffee essence. You’ll find this in the coffee aisle and it comes in a glass bottle. Bake the cakes until spongy and then make a syrup using more coffee syrup and sugar. You can do this by just melting them together on the hob. Pour a little syrup on the cakes and leave them to cool. To make the frosting you need to make two mixtures. 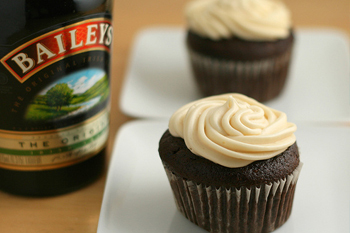 Mix mascarpone cheese with some Irish cream (use as much as your tastes desire but not too much that it will liquidate the frosting). The second mixture is simple whisked icing sugar and whipping cream. When these are both well mixed and thick, just fold them together and pipe the frosting on top of the cakes. These are a great novelty cakes for a party, and they really have the wow factor. Simply create plain vanilla cupcakes indicated above and then also make a plain buttercream. You can do this by mixing equal parts of unsalted butter with icing sugar and a little vanilla extract. Pipe or spoon this mixture on and form a smooth dome shape. 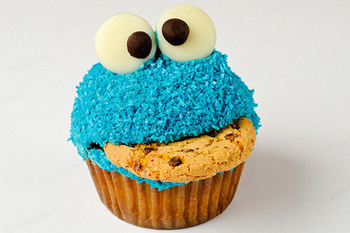 The secret with cookie monster cupcakes is in the decoration which can take some time. First of all mix some desiccated coconut with some blue food coloring, so you have a sandy light blue mixture that resembles the cookie monster. You must liberally sprinkle this over the cakes until they are completely coated and you cannot see the icing underneath. From here you can buy or make some small cookies and insert 1 straight into the topping (carefully) so it protrudes out like a cookie in a mouth. From here just make eyes from white chocolate buttons, and use a dark chocolate chip fixed to the button to make the pupil. Stick these into the cupcakes at angles and voila. The cupcakes look like cookie monster! 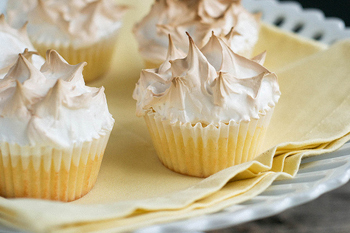 For a combination of classic deserts, it has to be my lemon meringue cupcakes. Start with making the cake mixture, but use some lemon zest and flavouring in the batter instead of the vanilla. This will create your basic lemon cake mixture. Once the cakes are made you simply need to buy some lemon curd and spread a little on top. You can alternatively inject it into the middle of the cake as a filling if you have a cook’s syringe. To make the meringue you simply need to mix plenty of egg whites with some caster sugar in a clean and cool bowl. Keep mixing and add a couple of drops of lemon juice which breaks down the egg whites. If you keep whisking it will start to get a lot thicker and it will ‘peak’ eventually and look nice and shiny and stiff. You can pipe a peak or swirl on top of the cupcakes and then put them back in the oven on a low heat for another 10 minutes or so until the meringue forms a solid shell. You can use a blowtorch (or grill) for just a couple of seconds to add some colour to the topping to make it look really professional. Francesca is a keen home baker and loves cupcakes. It’s traditional fair when it comes to baking but she loves Leeds Indian takeaway after a good baking session. Alternatively depending on taste, she might order Leeds Chinese takeaway. New cupcake ideas are always coming to mind and there are plenty of chances to get creative! 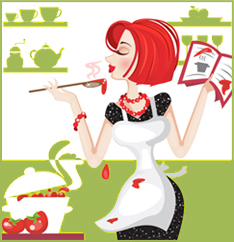 If you enjoy making cupcakes, you will enjoy this Cupcake Recipe Book by Patty Cake Patty Cake. It’s priced at only $9.95 and well worth it. This hands-on, step-by-step instruction of how to create perfect cupcakes means you can bake these cupcakes over and over and over again. Comes with a money back guarantee.